Such counter Blamespeak not only doesn’t work; it also makes you look like an HCP to those outside the situation. Then, the HCP uses your reaction to justify a new round of Blamespeak, and on and on. The key is to not over-react, but to respond quickly with a BIFF response to Blamespeak. Or not to respond at all, which is often the best idea. The rest of this book gives you a simple strategy for knowing when and how to respond to Blamespeak – or any frustrating behavior – with a BIFF response. Chapters Four through Nine provide BIFF responses to specific situations, but they also add tips which you may find helpful in any setting. Chapters Three and Ten explain some recent brain research that indicates that you may influence how others will respond to you, by how you choose to respond to them. So choose your words carefully. 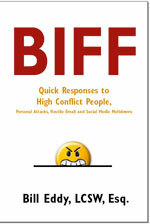 To learn how to write a BIFF, for more help information on dealing with high conflict people and their Blamespeak, visit our website: www.highconflictinstitute.com.